Okay, maybe I’m just a bit on the miffed side right now. But the more I think about it, the madder I get. Over the last year or so I’ve oscillated in my hydration between Nuun Water and my home-made Honey-Water™. Both drinks do exactly what they are meant to do, they hydrate without overwhelming you with sweetness and sugar. Part of what makes Nuun Water great is that it comes in little tablets. “Portable Hydration” is what they call it, and that’s exactly what it is. You carry the tablets with you so you don’t have to carry bottles and bottles of the stuff; simply fill your bottle with water and drop in a tablet. It’s that easy. The only drawbacks are if you lack a source of water on your run. My secret formula Honey-Water™ may not be as convenient (I don’t really see myself carrying a little honey bear with me on my runs), but when mixed just right, with my added secret ingredient, the flavor is light and refreshing, and the sugar gives you an extra boost of glucose to keep running hard. I also find that I don’t have to drink as much per mile as I usually do with plain, old water. I love them both and it pisses me off to no end. Although I have run every marathon initially carrying my hydration (two with Nuun and two with Honey-Water™), the truth is eventually I run out before the end of the race. The simple solution would be to carry more, but that means more weight, which means more work. That doesn’t sit well with me, especially when I’m running for time. Carrying 48 ounces of hydration is one thing on a LSD 20 miler, but it’s a completely different thing when you are racing a marathon. The reason I’m mad is that Gatorade has cornered the market on hydration stations at just about every half and full marathon I’ve been too; if it isn’t Gatorade, it’s the ugly step-brother Powerade. Both drinks are heavy on sweetness and hit my stomach like a round of buckshot. I’m not a huge fan of either and I generally don’t drink the stuff. Unfortunately, I’m afraid that I am going to have to start. They don’t hand out cups of Nuun or cups of my Honey-Water™ at races. I think that one of the contributing factors to my physical breakdown in New York was due to last minute nutritional changes – that included switching to Gatorade mid-race when I realized that I was going to have to find an alternate source of carbohydrates when I was unable to stomach the banana flavored honey stingers I was trying for the first time. Though I don’t blame Gatorade completely, I’m sure that my stressed system didn’t take to it too kindly. Unless I can come up with a better plan, I am going to have to train my body to accept Gatorade. Plain old water is not a practical choice. When I run for distance, I sweat like a LeBron James before a Celtics game. I need the nutrients and minerals that water alone can’t replace. Honestly, it would be nice to not have to carry anything in a long race other than a few Gu’s or Honey Stingers (just not that damned banana flavor though! ), but I wonder if Gatorade is really the answer. What’s your hydration strategy at the half- and full-marathon distances? This one’s out of my area of expertise, having only ever attained a distance of 8 miles. I posted it to my FB page – usually I can count on my runner friends to have opinions – lots of ’em! Thanks Paula! I don’t think this is completely out of your expertise though…you run, so you have to hydrate. Do you like Gatorade or do you carry your hydration? Or have you been to races where they hand out something else? For my marathon I use this plan: oatmeal like 4 hours before marathon then 5 gu for the race. I pop first gu 10min before start and then every 5 miles. So 4 gu are pinned in my shorts. For hydration I take water so I won’t have a sticky mess down my front. About 1-2 sips per water station. Gu gives the nutrition, water the hydration. That works for me. Hope it’s helpful. Because I’m out in the sticks I’ve gotten used to wearing a Camelbak on long runs – so put me down for carry. Over here it’s Lucozade Sport that has most presence at races i reckon. I tend to use it in the Camelbak sometimes but I water it down 50/50 as it can be quite over powering as you said re. gatorade. What about carrying your usual load of Nuun/Honey Water and at every other station grab a cup of water to keep the fluids topped up. The Nuun & Honey should give you enough of the other important stuff for the race? I usually use Ultima Replenisher, which has no sugar, so when I drank Gatorade at my first 1/2 marathon in September, I got so sick! I vowed that from now on, it’s BYOB! for me! I am going to try the honey-water mix soon. I always carry a camelbak full of 1-2 litres of water, then take on the nutrients I need through energy gels…. 1 caffeine energy gel at 5 miles, a normal carb gel at 10 miles, another caffeine gel at 15 miles, and a carb gel at 20 miles… then I have lucozade before and after a marathon. Felt full of energy throughout the run and always run with a camelbak as I’m worried I might bomb if I don’t have water with me. You could always leave your own juice/water at set points in the course the night before if you dont want to carry it?? For marathons, I usually rely on a mix of water and gatorade – but I only grab gatorade at maybe one or two stops along the course. I will eat a gel or two. And, maybe in the last 6 miles or so, if they offer it, I’ll drink some cola. But, really, I don’t consume many calories at all, and drink mostly water throughout the race. When I ran the Philly last year (my PR at this point), I drank only water and had one honey stinger. Some caveats with this plan, however: I train “empty” – meaning I don’t really consume many calories when I do long runs. This is actually I strategy I started doing when I started training for ultras to help my body learn how to burn fat more efficiently. And, second, anything longer than a marathon, I consume calories, usually in the form of whatever is available at the aid station. but, really, nutrition is soooooooo personal. I think it’s smart to try to teach your body to accept the race-day nutrition. As you say, it’s just not feasible to carry 48 ounces of fluids and fuels while trying to race a marathon. I know right now the Gatorade may be too much. But, if you train with it, you can train your stomach as well. Thanks for sharing – your honey water sounds intriguing…. Ugh. This is one of the problems I deal with all the time and have been working on since Boston. One of the areas I think I really screwed-up on that caused my cramping, etc. during the race. I have the same problem with Gatorade. So, during my marathon training I found something I could use without the harsh effects on my stomach (Accelerade) and decided to carry it with me, along with taking GU 15 minutes prior and every 5 miles (or 45 min) throughout the race. So, I had the GU and 4 bottles of self mixed 3/4 solution of Accelerade (it was still too sweet full strength). Much like Gatorade though, I cannot tolerate the Accelerade and GU too close together. I was just going to get water on the course and alternate every mile water/Accelerade. Of course I screwed it up and ended-up skipping water stations, drinking Accelerade then realizing I had to take a GU… I was a total mess. Since then I’ve been experimenting with several things, and although I haven’t totally figured it out, I’m hoping to have it solved by the time Boston rolls around again. Ultimately, my aim has been to increase my metabolic efficiency and it seems to have been working. What I mean is I’ve been progressively extending the period of time I can run WITHOUT “nutrition,” so that I am not so dependent on GU, honey, or any other source. I make sure that I am well-hydrated prior to any run. I’ve been drinking a lot of Coconut water (I like Vita Coco the best) regularly, and if I make sure I consume 16 oz of water with 1 Nuun tablet at least an hour before ANY run. If I’m going on any run 10 miles or longer I make sure I add 2 scoops of HEED to that bottle. Then I carry only water and GU. I’ve gotten to the point where I don’t need to take a GU until 90 minutes into any run. After that, I play it by ear and listen to my body. I’ve had days where I haven’t needed another GU for 45 mins other days 30 mins. One run I felt so good I didn’t take another one at all, but ate everything is sight once I got home 90 minutes or so later. I fully intend on not carrying any liquid with me in Boston this time. I just plan on carrying the gels I think I may need and getting water at the aid stations. I may even carry a couple of tabs of Nuun in a small plastic bagged pinned inside my shorts and just pop them directly into my mouth whenever I feel I need one. This worked for me on a couple of my hotter runs this Summer (I sweat like you do and am OFTEN covered in thick salty crust), and you know when you’ve had enough because they suddenly taste gross and you spit it out and rinse it down with water. So, much like you, it’s a work in progress, but I’ll keep you updated on what is working for me. I will not give in and just breakdown and use Gatorade simply because they have the most money and are able to sponsor all the major races. … And by “metabolic efficiency” I mean training my body to burn fat more efficiently, like Maria said. And I forgot to add that I currently don’t take ANYTHING with me at all on runs 10 miles or shorter. The metabolic training IS working. This is so hard. I don’t have a problem with gatorade, but I do tend to cut it with water. I was going to suggest maybe (if your family will be spectating) starting out with your own hyration and then refiilling halfway ish along the course from a stash your wife could have with her. But this means that seeing her would be critical to your success, and that just leads to more race stress. For the one marathon I ran, I carried nothing except my own gels. I took water and gatorade from every station, drank some water and mixed the rest with the gatorade and drank that. Personally, I like Gatorade. It’s way better than the alternatives I have experienced at other marathons (Powerade @ Long Beach and the sickening Cytomax for the Rock n Roll series). I have used Nuun on my long runs before, but I usually don’t bring anything. I hate carrying anything with me on runs and prefer to hit up some of the water fountains I know of along the way. I think you need someone on a bike carrying your hydration. I saw a woman at Long Beach with her husband/boyfriend riding along side us on his bike constantly handing her a water bottle. He was even rallying the spectators to cheer for her. Probably not something you can pull off in a race like New York or Boston though. Maybe I’m odd, but I’ve never had a problem with Gatorade, Powerade, or anything else of that ilk. And I’ve never found a gel that doesn’t sit well with me. I think that perhaps I run lower on energy than I realize at the end of marathons as I tend to take in very little calories (mostly Gatorade at each water stop – at least what yield I get from drinking on the run – and maybe a gel or two), so I am going to experiment with getting more aggressive. But I’ll still probably stick to the commercially available stuff – I’m just too lazy to experiment with my own concoctions. Try Gu’s Vanilla Gingerbread. I’ll be impressed if anyone can down that without gagging. Grabbed it without looking at RnR Vegas. Not pleasant. I cannot tolerate Gatorade at all and discovered this during my training for Boston. I use the Power Gel and carry water. We also used clementines which we’d peel and put into a tiny baggie which didn’t have a lot of weight but was a great supplement. On Marathon Monday there were tons of people handing out orange slices and we used those as a supplement. How about contacting the company that makes the drink that works for you and see about getting them on the course? It can’t hurt because if you don’t ask the answer is always no! Good luck Luau – let us know what you come up with. Like others, I’ve made some peace with Gatorade, but it has to be a half & half mixture – unless you cut it, it is just too sweet to tolerate. During a half I might stick a Gu (chocolate only) in a pocket or pin it to my skirt, and for a full I’ll pin a few on, and rely on whatever water & sportsdrink is on the course. But for a marathon, I usually do Gu & water at every 45 min’s (or as close as possible given water stops etc..). When I do the Gu, I don’t wash it down w/Gatorade. But at other stops I grab a cup of Gatorade and a cup of water – mix the two and gulp while I run. Luckily most races don’t fill the cups so its minimal mess. I swear that half of marathon training is figuring out the logistics…what shoe/sock combo works best, where to strategically place the aquaphor or body glide to prevent chafing, what to eat night before/morning of, how much coffee, water to have before…and then trying to keep as many things constant as possible for race day. I stockpile my favorite Gu flavor (chocolate only!) ahead of time and pin it to my clothes – never wear new clothes for race day (no matter how cute). I pack my own peanut butter, jelly and wheat bread and make a sandwich to have before heading to the start, store skim milk in mini-fridge or in a bucket of ice overnight. I’ve been known spend the night before a marathon scoping out where the closest dunkies or buckies is and what time they open – so I can get my standard pre-race coffee – no hotel room coffee or lobby coffee bar. Good luck! I’m hoping to get back to training regularly again, but for now I’ll marathon vicariously thru you! 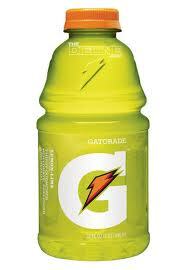 What if you diluted the gatorade with water? I only train with gatorade in the wicked heat, but have loved it in both my marathons. Maybe you will learn to love it while training for Boston? Hey! I see your posts on Dailymile all the time…and knew you had a post on honey water so went back to check it out. What was the outcome for this post? I was wondering if you had any advice 🙂 I am on a special diet for medical reasons that doesn’t allow me to have any sugar and sugar in gatorade, etc. has NEVER sat well with me either. I agree, I get SO MAD that every race has gatorade or even worse accelerade. I’d like some cups of natural fresh squeezed juice sitting out there – haha! I can have honey and this is what I often use for my 20 mile training runs – except I jog into my house and put it on a spoon. I was thinking of purchasing a Gu Flask and filling it with honey for Boston. I’m so worried about what I am going to do – that will be my first marathon without gatorade. I’ve never been able to use a Gel – the few times I tried it was a disaster. Is straight honey too strong or should I mix it with something? Have you ever tried the Gu Flask? My last half marathon I put some honey in a plastic bag and it was sooo messy I eventually had to ditch it. I missed the gatorade, but I didn’t have to deal with my stomach feeling terrible for the entire next week like usual. Have you come up with any other natural sources for gatorade or gels?? I’ve been googling around the Internet without much success! You are doing Boston also, right?? Hi Cynthia – thanks for your comment. Sadly, I have not come up with an alternate plan. In fact, I’ve spent the last several weeks training my body to accept sips of Gatorade every other mile. I wish I had a better answer, but unfortunately for us, that is what they hand out at Boston. One solution I did toy with was placing friends at the half-marathon point of the race to hand me a fresh bottle of Honey-Water™, but a.) it’s not easy for spectators to place themselves where they want and b.) it’s not always easy to spot your friends, especially in a race as big as Boston. The good news for me is that my body seems to be taking the adjustment without too much protest. Do you have friends or family that you could position throughout the race? If so, you could make slightly thicker versions of honey-water in smaller bottles and switch out as you pass them. If you had 3 – 5 people set up, it wouldn’t matter if you missed 1 or 2. And I do think straight honey is a little tough (though have you tried Honey Stingers? They are essentially honey with a little extra in them). Good luck!